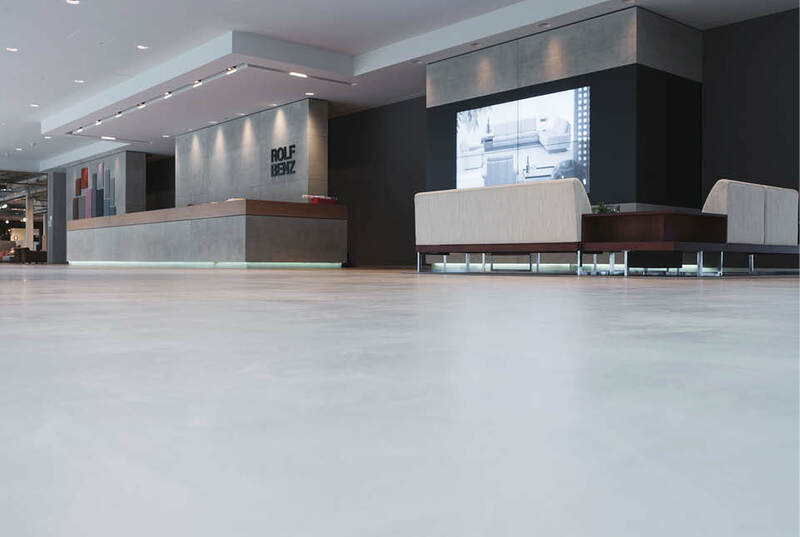 Ardex Pandomo K2 graces this lobby at the headquarters of Rolf Benz, a high-quality German-made furniture company based in Nagold, Germany. In the concrete world, microtoppings can save money by allowing a surface already in place to be restored. They can rejuvenate cracked, chipped or plain surfaces. Their ability to mimic items such as stone or tile is yet another reason why contractors won’t stop using them. “With the right application technique it can look like a piece of granite, a piece of marble or wood or stone— just about anything you can imagine,” says Glenn “Buster” Osteen, technical director of McKinnon Materials in Tampa, Florida. And you can do this without increasing the cost per square footage, he adds. 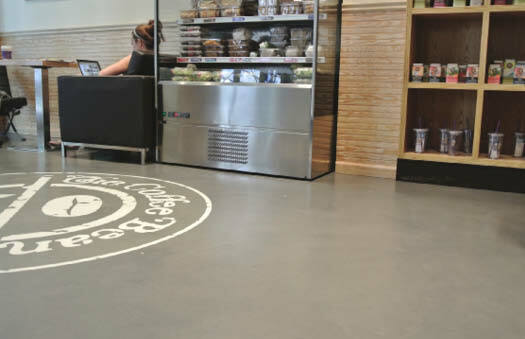 Dominick Cardone of Diversified Decorative Finishes in Brooklyn used Duraamen’s Skraffino concrete microtopping in The Coffee Bean, a New York City coffee shop. 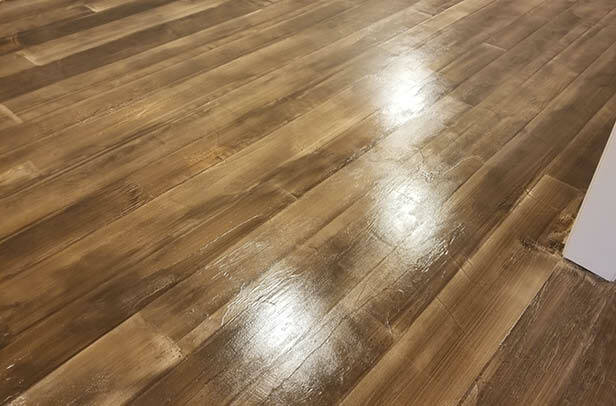 The floor was integrally colored with a custom blend of Duraamen’s Colorfast and coated with a clear water-based epoxy, followed by two coats of a water-based matte polyurethane with 240 mesh nonskid additive. Is there a difference between thin toppings and microtoppings? The materials are used in the same way, but the description is defined by their thinness. “Thin toppings” generally refer to cementitious overlays applied at a depth of 1 inch or less, sometimes as thin as 1/16 inch, over an existing slab. While they look like regular concrete, they’re not — the regular variety has no strength when applied that thin. Thin toppings can be troweled on, broom-finished or applied with a squeegee. Microtoppings do not “flow” because they are so thin, so they aren’t considered self-leveling. 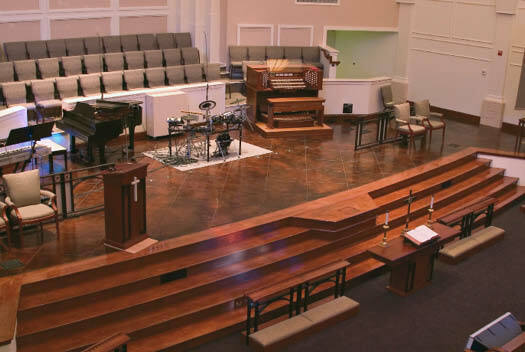 Self-leveling toppings generally require at least 1/4-inch material and are poured into place. Microtoppings can be as thin as 20 mils (.02 inch) and applied in several coats to achieve a textured troweled look. Most microtoppings are not polishable. Victor Pachade, general manager of Duraamen Engineered Products Inc., based in Cranbury, New Jersey, says there is no difference between the two phrases, however, the term “thin-set” is widely used in the tile industry. McKinnon’s McKrete overlay is an acrylic and epoxy cementitious material that can be installed on existing concrete in a wide variety of stencil patterns and colors. Many toppings, like the McKrete overlay system from McKinnon, are acrylic-modified cements, which infuse cement with polymers to increase flexibility and strength at incremental thicknesses. Acrylics bond well, provide strength and have a superior weather-resistance, says Osteen. “Microtoppings have been used ever since the 1970s for interiors and exteriors,” for everything from waterparks to parking garages, says Osteen. He can’t think of anywhere McKrete isn’t suitable. Bart Sacco, owner of Kingdom Products, a manufacturing company based in Scranton, Pennsylvania, prizes microtoppings for restoration of concrete that’s past its prime. But success in their use comes with not skimping on surface prep. Sacco provides custom formulation and lab services offering toppings in one- and two-component formulations for the company’s toll-blending clients. The benefit of the one-component formulation is consistency. “With a one-component product the only control the end-user has is over how much water is added,” Sacco says. And if end-users mix the specified amount of water with the powder, they’ll get the same consistency each time they use that product, he says. While a two-component system allows for more flexibility, it also requires that the installer be more skilled working with the material and be able to adapt it depending on the environment. For instance, Sacco says, installers in a Southern region don’t need the polymer concentration they need up North because the South doesn’t experience such harsh winters and as much freeze-thaw action. They can get by with a higher dilution rate. As far as aggregates go, small aggregates like fine sand are suitable for use in microtoppings. Larger aggregates cause problems but are possible in limited quantities. Pachade says his company is developing some techniques where users can broadcast fine glass aggregates and create interesting looks by spraying the microtopping. Scott Balch of Texas Bomanite installs microtoppings anywhere the substrate is structurally sound and the desired finish is a concrete look. Bob Seman of Seman Floor Leveling Systems in Washington, Pennsylvania, about 20 miles south of Pittsburgh, is one of only 25 LevelMaster Elite Installers, the highest classification of trained installers bestowed by Ardex Americas. 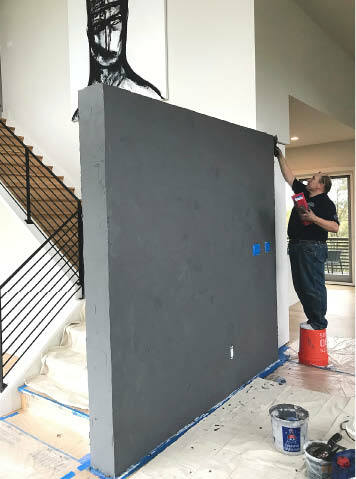 “I like the Ardex SD-M because it is really quick to use, it comes in white or gray and goes down in two or three coats that are about the thickness of a dime,” Seman says. The coating also has a hand-troweled look, which is a big plus, he adds. But probably the attribute he likes most is SD-M doesn’t add height, which is very attractive for areas that must be accessible to the handicapped. Texas Bomanite’s Balch says microtoppings should only be installed where vehicular traffic is light as they won’t hold up in heavy traffic. They also require a sealer. “These systems are protected by a topical sealing system,” he says. “If the end-user is not committed to maintenance of the sealers, the overall appearance will not hold up” and its life will be cut short. For one recent job, Seman had a high-end client who wanted to match a wall covering to a painting. He used Ardex Pandomo W1, a self-drying, trowel-applied finishing compound for walls and ceilings, to match the color, texture and motion of the painting on her walls. That versatility and ease of use is why people continuously reach for microtoppings, whether for walls or floors, Seman says. Brian Raub, a SureCrete installer with Brinycrete Decorative Concrete in Lafayette, Indiana, likes the workability of SureCrete’s microtopping products. About 90 percent of his business is wood-look floors and hand-carved flagstone patterns. 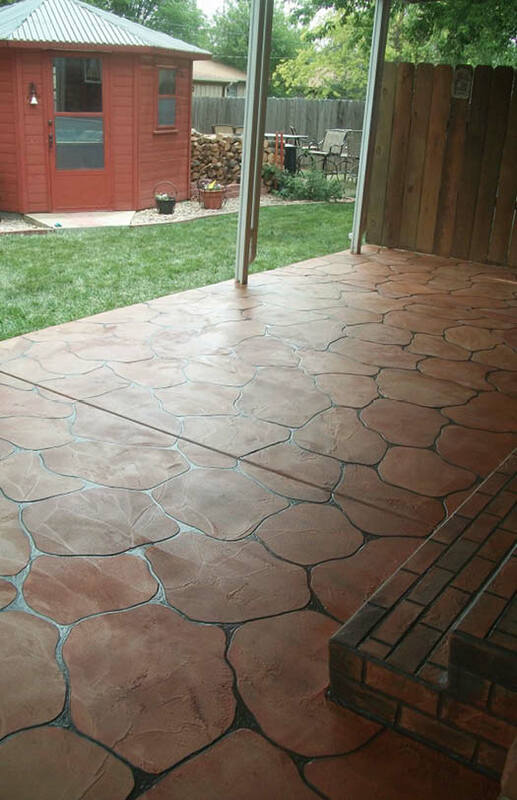 “I use the cracks on cracked patios and sidewalks for the patterns of the flagstone,” he says. Brian Raub with Brinycrete Decorative Concrete in Lafayette, Indiana, appreciates the versatility of a microtopping, a product he uses to create both woodlook flooring and hand-carved flagstone patterns. But most of his customers want the look of wood. He’s installed wood-look floors in living rooms, kitchens, bedrooms and especially basements, where people had their flooring ruined from floods. He appreciates the versatility of the microtoppings because the result looks 100 percent handmade.